The general consensus among mainstream comic book publishers is that comics aimed at kids, or all-ages comics, don’t sell. And sadly, they’re usually right. 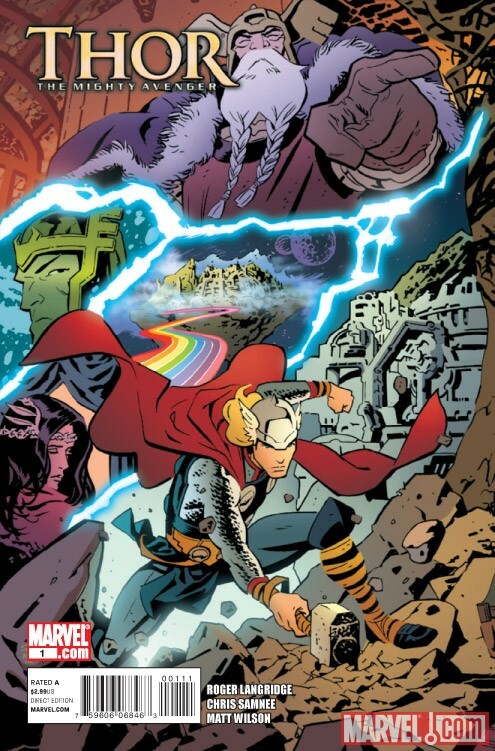 Take for example the apparent cancellation of the endlessly charming Thor: The Mighty Avenger by Roger Langridge and Chris Samnee. Even an impending big Hollywood movie of Thor couldn’t generate enough interest to sustain the series past eight issues. Why? Maybe it’s because there are also about four other comics starring Thor or some Thor-like character and who can keep them straight? Maybe it’s because too many comic book stores cater to their established audience base of young-ish to older adults who aren’t interested in an all-ages comic book no matter how much praise and acclaim it gets. So kids comics are doomed, right? Not quite. Fortunately a growing number of comics stores actually do have enough business savvy to diversify their customer base. In support of this, Diamond Comics, the primary distributor for comics shops, has been amping up their KidsComics.com website, now with a handy-dandy order form kids and parents can print out to make sure their local store orders what they want. And more effectively, and unlike ten or more years ago, there are now other ways for comics to find their audience. As examples, walk into a book store and see how long it takes you to stumble over a display of Jeff Kinney’s Diary of a Wimpy Kid books. Granted, they technically aren’t comic books (or graphic novels), but often not far from away are copies of Bone by Jeff Smith, Owly by Andy Runton, the Wonderful Wizard of Oz adaptation by Eric Shanower and Skottie Young, The Muppet Show Comic Book by Langridge himself, and lots more. And they’ve all been selling very well. Yes even the Twilight graphic novel adaptation by Young Kim. And tons of manga too, plenty of it age appropriate (see Manga4Kids for recommendations – I’ve still got a lot to learn myself). The School Library Journal has a great blog to help find Good Comics For Kids. There are also great web-comics for kids online. Two of my favorites are the whimsical Abominable Charles Christopher by Karl Kerschl and the delightfully absurd Axe Cop by Ethan Nicolle and Malachai Nicolle (age 5!). LunchboxFunnies.com is a good place to start, although they sadly haven’t updated for several months now. Hopefully it’s just temporary. There have been a few sites attempting to track age appropriate web-comics but sadly most are over a year old now, basically ancient artifacts in internet time. Plenty of the above mentioned comics have been released as digital comics on mobile devices and online through services like ComiXology. Although they have yet to parse out kids comics to make shopping easier, they do have age ratings, which helps a great deal. Much of Atomic Robo by Brian Clevinger and Scott Wegener is recommended for kids 9 and up, and it is regularly among the most downloaded. So kids comics do sell. You just have to know how to get them to kids.